Home Appliance readers have rated Honda Generator EM1600X EM1800X EM2200X Owners Manual 3.7 out of 5.0 based on 3 product reviews. victor manuel monge gonzalez on Jan 29, 2014. 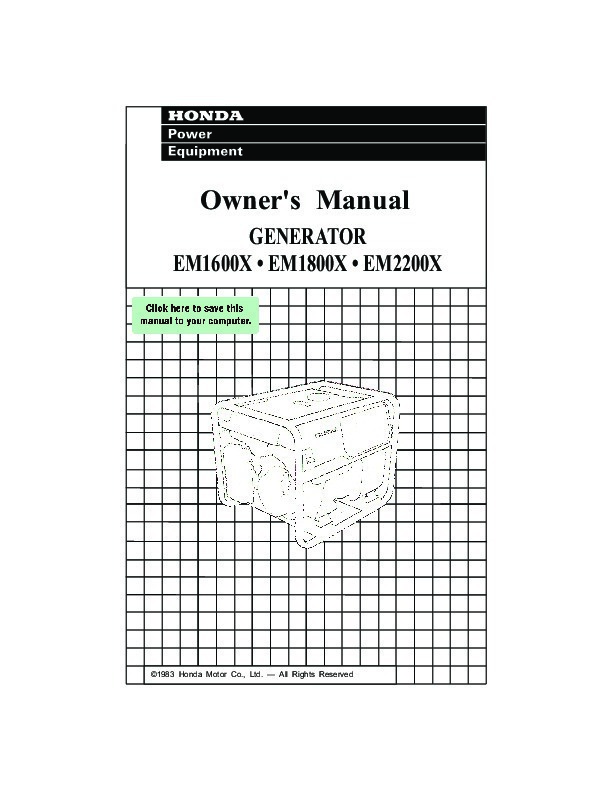 Owner’s Manual GENERATOR EM1600X · EM1800X · EM2200X 1983 Honda Motor Co., Ltd. — Thank you for purchasing a Honda generator. This manual covers 2200X generators. product information Honda Motor Co., notice and without operation and maintenance of the EM1600X, 1800X and All information in this publication is based on the latest available at the time of approval for printing. Ltd reserves the right to make changes at any time without incurring any obligation. may be reproduced without written permission. No part of this publication This manual should be considered a permanent should remain with the generator when it is sold. Pay special attention part of the generator and words: to statements preceded by the following m Indicates a strong possibility life if instructions are not followed. CAUTION: instructions NOTE: Indicates a possibility are not followed. of severe personal injury or loss of of personal injury or equipment damage if Gives helpful information. If a problem should arise, or if you have any questions about the generator, consult an authorized Honda dealer. B Honda generators are designed to give safe and dependable service if operated according to instructions. Read and understand the Owner’s Manual before operating the generator. Failure to do so could result in personal injury or equipment damage. 1 CONTENTS CONTENTS 1. GENERATOR SAFETY L 2. COMPONENT IDENTIFICATION 3. PRE-OPERATION CHECK . 4. STARTING THE ENGINE l High altitude operatioty 5. GENERATOR USE . 6. STOPPING THE ENGINE MAINTENANCE . i: TRANSPORTING/STORAGE . 9. TROUBLESHOOTING 10. WIRING DIAGRAM ll.SPEClFlCATlONS 12. WARRANTY SERVICE 3 4 6 8 10 11 14 15 24 25 27 29 30 2 1. GENERATOR SAFETY To ensure safe operationPlace the generator at least 1 m (3 ft) away from buildings or other equipment during operation. Operate the generator on a level surface. If the generator is tilted, fuel spillage may result. Exhaust gas contains poisonous carbon monoxide. Never run the generator in an enclosed area. Be sure to provide adequate ventilation. Know how to stop the generator quickly and understand operation of all the controls. Never permit anyone to operate the generator without proper instructions. Keep children and pets away from the generator when it is in operation. Keep away from rotating parts while the generator is running. The generator is a potential source of electrical shocks when misused; do not operate with wet hands. Do not operate the generator in rain or snow and do not let it get wet. When charging a battery l l Battery electrolyte contains sulphuric acid. Protect your eyes, skin and clothing. In case of contact, flush thoroughly with water and get prompt medical attention, especially if your eyes are affected. Batteries generate hydrogen gas which can be highly explosive. Do not smoke or allow flames or sparks near a battery, especially during charging. 3 2. COMPONENT IDENTIFICATION FUEL GAUGE (Except EM1600XI VOLTAGE METER (Except EM1600X) AIR CLEANER ENGINE SWITCH PILOT LAMP (Except EM1600X) GRIP BREAKER OIL ALERT LAMP / KNOB AGE ADJUSTMENT (Except EM1600XI / DC CIA/CUIT BREAKER DC TERMINALS v OIL LLER CAP FUEL CAP TANK FUEL TANK -SPARK PLUG I MUFFLER EXHAUST OUTLET 5 3. PRE-OPERATION CAUTION: stopped. CHECK Be sure to check the generator on a level surface with the engine 1. Check the engine oil level. CAUTION: Engine oil is a major,factor affecting engine performance service life. Non-detergent or vegetable oils are not recommended. and Use Honda 4-stroke oil, or an equivalent high detergent, premium quality motor oil certified to meet or exceed US. automobile manufacturers’ requirements for Service Classification SE or SF. (Motor oils classified SE or SF will show this designation on the container.) SAE low-40 is recommended for general, all-temperature use. Other viscosities shown in the chart may be used when the average temperature in your area is within the indicated range. Remove the oil filler cap, and wipe the dipstick with a clean rag. Check the oil level by inserting the dipstick in the filler hole without screwing it in. If the oil level is below the end of the dipstick, add oil to the upper level mark on the dipstick. NOTE: The Oil Alert System will automatically stop the engine before the oil level falls below the safe limit. However, to avoid the inconvenience of an unexpected shutdown, it is still advisable to visually inspect the oil level regularly. UPPER LEVEL LOWER LEVEL 6 2. Check the fuel level Check the fuel gauge (EM1800X and EM2200X only), and refill the tank if the fuel level is low. Use low lead or unleaded automotive gasoline with a pump octane rating of 86 or higher.